I always recycle batteries in the library, to be completely honest, I only started doing it about 2 years ago. Before that, I didn’t even know how to recycle them, or where… It feels so good give back to environment, collect all the old batteries and bring them to the beginning of their new journey. Recently, I had about 10 old batteries that I’ ve been saving, and when I got them to the bin, it was full. Literally full to the top. I was so happy to see that! Keep in mind that using reusable batteries and charging them is even better for Mother Nature. Some batteries contain nickel-cadmium. In landfills, the cadmium dissolves itself and can seep into the water supply, which then causes serious health problems to all who come in to contact with it through drinking water or in other ways. 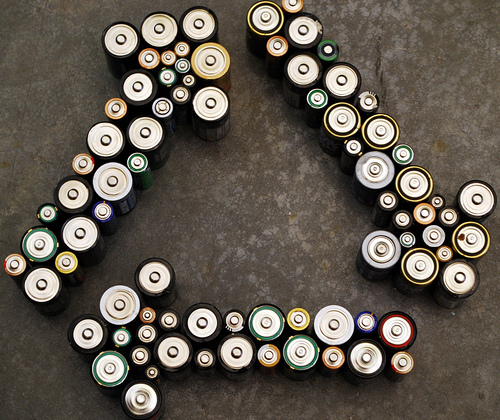 Recycling batteries in a safe and proper way will help rid these health risks. Nickel-metal-hydride may be considered environmentally friendly but the main derivative–nickel–is deadly. Electrolyte is also included in this type of metal, which is very hazardous in large amounts. Recycling these batteries.is very important. Though lithium batteries do not contain toxic metals, fire is a large possibility if the metallic lithium is exposed to moisture while the cells are corroding. Recycling batteries not only helps keep the heavy metals in batteries out of the air and out of landfills but it also saves on resources, since recycled plastic and metals are often used to make new batteries. This entry was posted in batteries, heavy metals, rechargable, recycle, reusable, toxic, Uncategorized and tagged batteries, battery, heavy metals, rechargable, recycle, reusable, toxic. Bookmark the permalink.